More and more workplaces are seeing the benefits of workplace training for their staff and their business. “We’re delighted to have received really positive feedback – it’s helped boost morale, upskill our teams and ensure greater awareness around health and safety for cleaning,” shares Human Resources Director, Marion Etches, of Compass Group New Zealand (Compass). Compass has provided food and support services to hospitals and healthcare facilities in New Zealand for more than 25 years. Careerforce is privileged to have been part of its journey to upskill the company’s cleaning and orderly workforce to continuously improve their quality service. Marion comments, “Compass has always invested in training for our people. We have many different courses and training options across almost 300 national sites, including Tairawhiti DHB. “We linked in with Careerforce as the Industry Training Organisation that covers Cleaning. 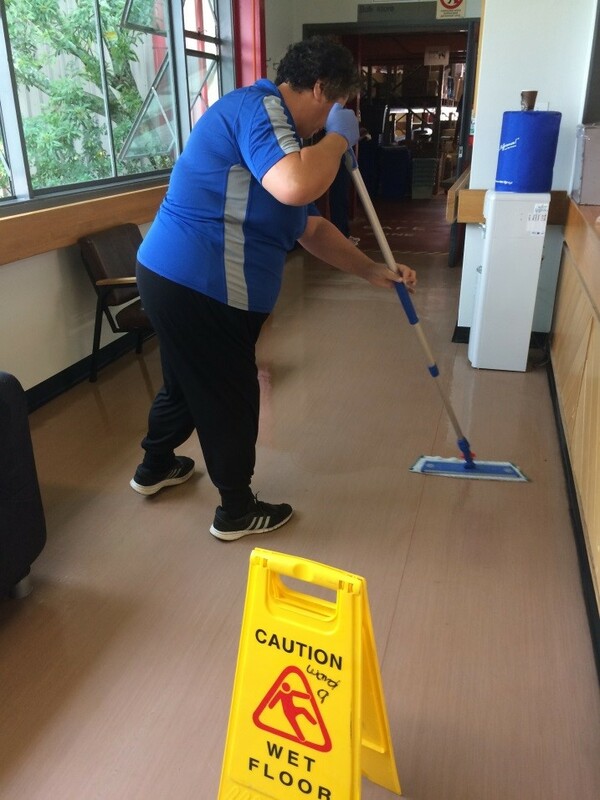 The New Zealand Certificate in Cleaning (Level 2) matched the skills required by our cleaning teams to perform in their roles safely and well. Best of all the training could be delivered on the job. The Health Care Facilities option builds on the core skills and knowledge to recognise the skills required for cleaning in a health care facility,” she adds. Compass believes that training helps teach new skills and increases awareness around best practice. They invest a significant amount of resources to support their people to do a good job. For Caroline Nepe also from the housekeeping team, the training made her want to keep going. “I love coming to work. I love my job and certain aspects of my job give me great satisfaction. Having done the training, it makes me want to keep upskilling myself. It is worth it,” she shares. Caroline thought that the group training approach worked well for her. “It was challenging putting it down on paper, but talking to other colleagues and bouncing ideas off each other helps,” she adds. Workplace training or industry training is an efficient and cost-effective way to upskill staff, boost teams’ morale and ensure best work practices are being applied. They can be contextualised to tie in with your organisation’s policies and procedures. The programmes are designed to meet the needs of the industry because they are developed with the industry. Contact us to discuss how Careerforce’s flexible workplace training programmes can work for your organisation. Give us a call at 0800 277 486 or send us a message at info@careerforce.org.nz to have a Careerforce Advisor get in touch with you.